The Spa Sensations 3'' Visco Elastic Topper has one inch of visco memory foam and two inches of Visco Elastic air foam that offer the ultimate support and comfort. 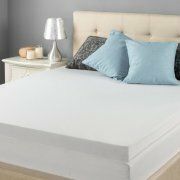 One of the thickest memory foam toppers available in the market, this Spa Sensations mattress topper is weight sensitive. The foam molds itself to the shape of your body to give complete support. This revolutionary air ventilation technology helps to provide uninterrupted sleep through the night.